Standardbreds are consistently showing their versatility, whether it’s for riding or driving, for show or pleasure. 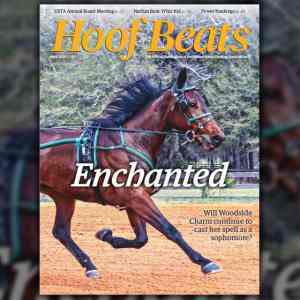 Hoof Beats is happy to share stories from readers about their favorite Standardbreds and how they enjoy working with them. This month, Charlotte Gelston writes about some ideas she has for making life easier around the barn. When I first started driving 27 years ago, I was told to buy a “harness rack set” for storing my harness. Being new to equine sport, I immediately did as I was instructed. 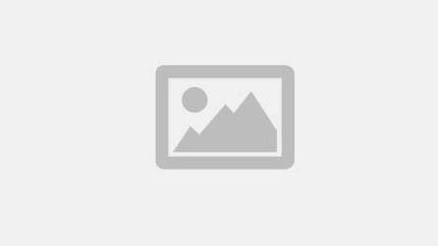 I dutifully had the three separate pieces mounted on the wall of my tack room; however, my husband was not happy with the expense, or with the trouble of mounting them on the wall. They also took up a lot of space. Several years later, the number of boarders had increased in our barn, as had the number of saddle racks mounted in the tack room. One of my boarders asked me to teach her how to drive, since her horse was already harness-trained. She bought a cart and harness. Now the difficulty was how to store her harness. She did not wish to spend the money for the nice set of racks as I had foolishly done, nor was any more wall space available. Being a resourceful person, I gave it some thought and decided to try using one of the saddle racks. I hung the bridle on the lower hook and put the breastplate connected to the neck strap and traces over the higher part in front, where the pommel of the saddle would be. The saddle of the harness, connected to the back-strap, reins and breeching, fit behind the breastplate on the center of the saddle rack. SPACE SAVER: The author has stopped using the standard three-piece harness rack (left) for hanging harnesses at her barn and now uses a more compact saddle rack (right) for each set. Voila–a perfect fit! It proved to be a handy, economical solution to the dilemma. 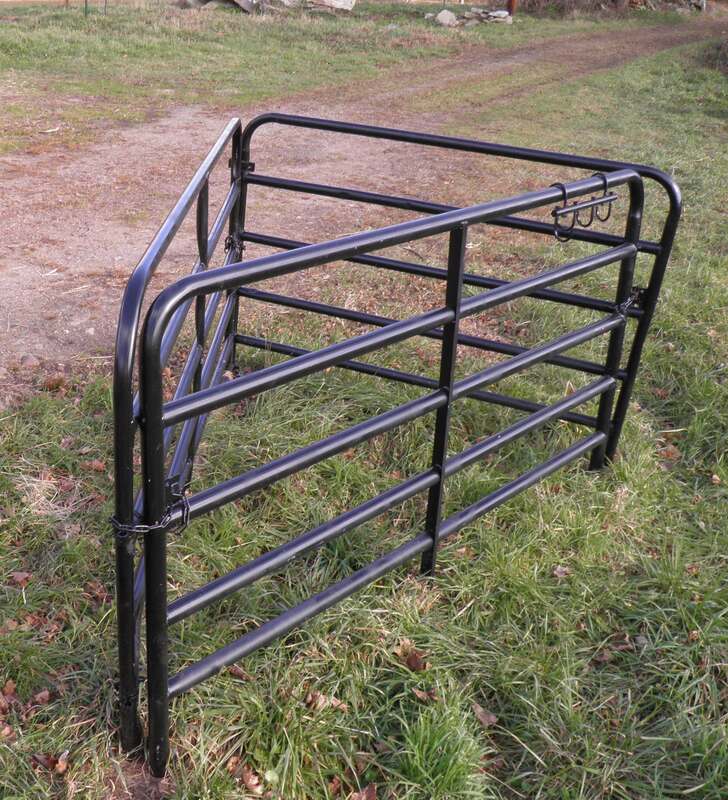 Three old gates formed into a triangle make the perfect harness wash rack. Since we use synthetic harnesses, we like to rinse them off after each use to avoid major cleaning later on. But how to do it quickly and easily was the question. Several old, unused metal gates from the days when our place was a dairy farm were in the machinery shed. I took three panels, connected them to each other in a triangle, and formed a free-standing framework. It was dubbed the “wash rack.” A thick piece of leftover lumber under each of the three corners kept the gate legs from touching the ground. It worked well, but looked shabby with the rust showing. A good cleaning and coat of Rust-Oleum gloss black spray paint gave each panel a facelift. It looked presentable as well as practical, and can hold three harnesses at one time. 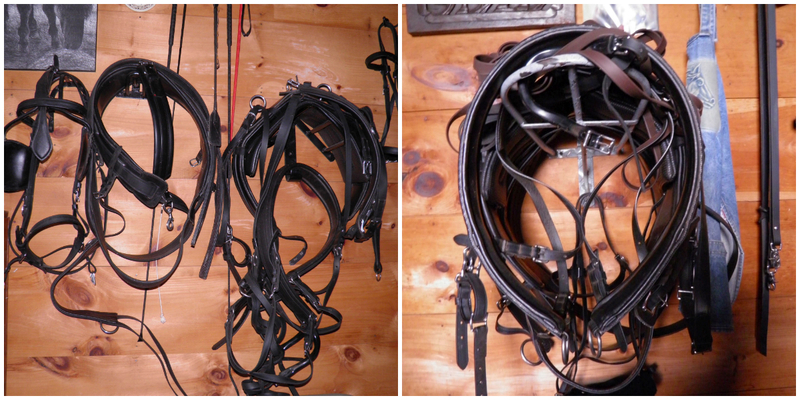 With the “wash rack” set up next to the barn, it is easy to hose off the harnesses and let them dry. Unused horseshoes welded at right angles to each other make useful holders for barn tools. Before I discovered the joy of horse boots, my horses were shod. What can be done with a lot of old horseshoes? 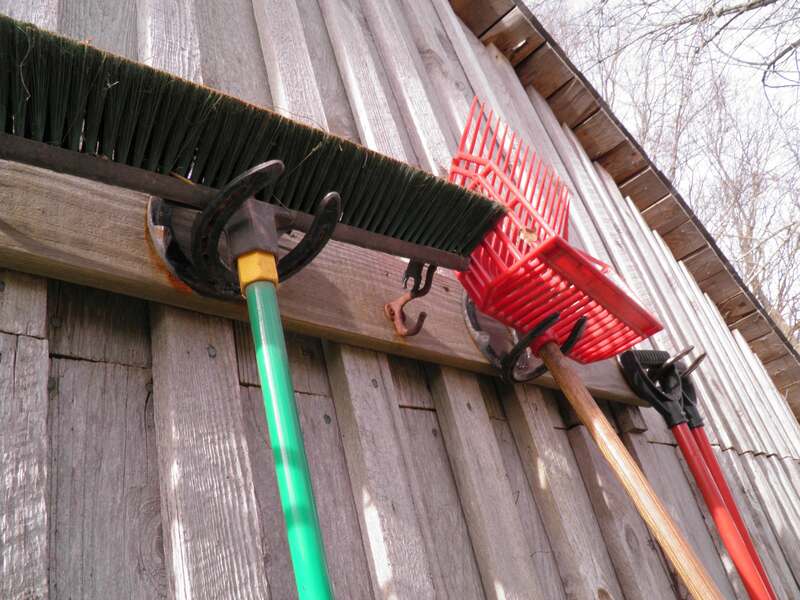 They make excellent holders for hanging up barn tools. We had a friend who did welding, so I asked him to weld two horseshoes with the toes together, at a right angle. The lower shoe can be mounted to the wall, and the upper half forms the “hanger.” A long broom can be put on top of the upper part, with the handle down through the open section of the shoe. By putting the handle of a shovel through one side of the shoe, you can fit two shovels on one hanger. I have several of them mounted on the side of the staircase leading up to the hayloft. The longer-handled items go up high, and the shorter ones fit on the lower ones. Several more of them are mounted on the run-in shed, outside of the fence line. Having heard about the “slow-feed” hay nets a few years ago, I bought one for each horse. It took several brands before I settled on the one that I, and the horses, liked best. There was only one drawback: It was difficult to get the hay into the net. An inexpensive rectangular plastic storage bin was the solution. It measures 27×16-1/2 inches, which is about the size of flakes of hay from a normal 45-lb. bale. My intention was to put the net inside the container and then fill it. But another stumbling block arose: the stiff rope around the top of the net was too short to allow me to put the net into the bin fully open. Substituting a 7-foot length of softer nylon rope for the shorter, stiffer one accomplished what I had hoped to do. By simply aligning the corners of the hay net with the long sides of the bin and bringing the excess netting out and over the sides, you can quickly place the flakes of hay (a third of a bale) into the container. After pulling up the sides and tying the rope, it is ready to hang with a double-ended snap. 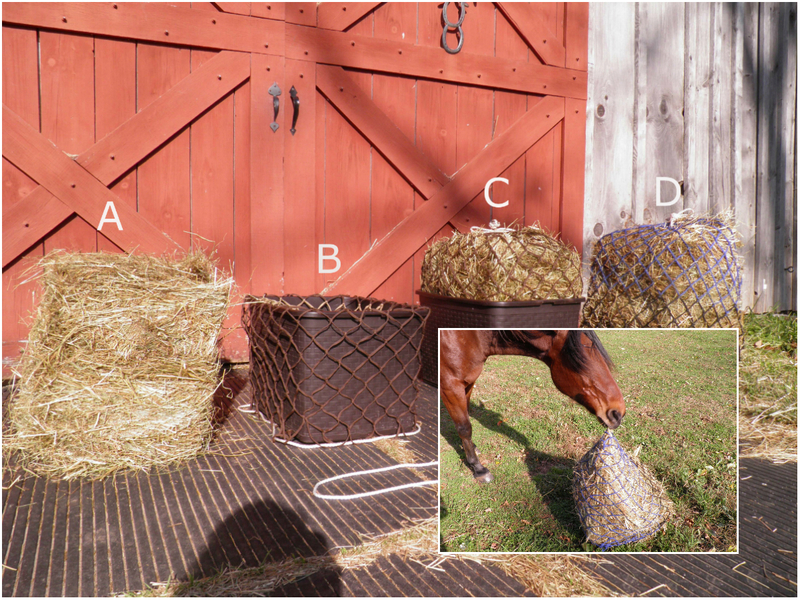 IN THE BAG: This photo shows the author’s steps for netting hay. A: She starts with a third of a 45-lb. bale. B: The netting is set inside the bin, with the excess hanging over the sides. C: The hay goes in and the netting comes up. D: The secured hay net is ready to got. Inset: This setup allows horses to simulate natural grazing when grazing season is over. When grazing season is over, the horses are fed their hay outside during the day. The softer rope can be tied into a double-bow, which the horses cannot untie with their teeth. They nudge the hay net and move it around, simulating natural grazing. One time “Rhythm” decided to appropriate “Blue’s” hay net. But Blue saw him coming, grabbed the net in his teeth, and took off trotting! Rhythm gave pursuit. Just as he was closing in on him, Blue dropped his net and calmly walked over to the hay net Rhythm had abandoned. The two of them love nothing more than bringing their nets to the far reaches of the three acres surrounding the barn, which means I have to hike around to find them. Perhaps they think I need the extra exercise. They are correct. My friends complained about how difficult and tedious it was to stuff hay into the slow-feed nets they had purchased, so I demonstrated my method. They were delighted and copied my idea. “Imitation is the sincerest form of flattery” after all. To see more from the February 2018 issue of Hoof Beats, click here.